Touring Egypt 10: As I am sure your finely tuned senses have detected (being, as you are, the ever-observant, engaged reader), tonight’s post is underwater. Yesterday was on land, so today must be underwater. Hello: pattern! This ghost moray was relatively small (as moray eels go) and very shy. I got lucky because it seemed as curious about me as I was surprised to see him (at least until my strobes went off). My habit is to dive with my camera in shooting position, held with both hands and in front of me as I cruise along the reef. That often gives me one free shot with no any sudden moves before the creature being photographed flees. This eel saw me first but did not immediately retreat. Instead, it turned to look at me as I bubbled past. 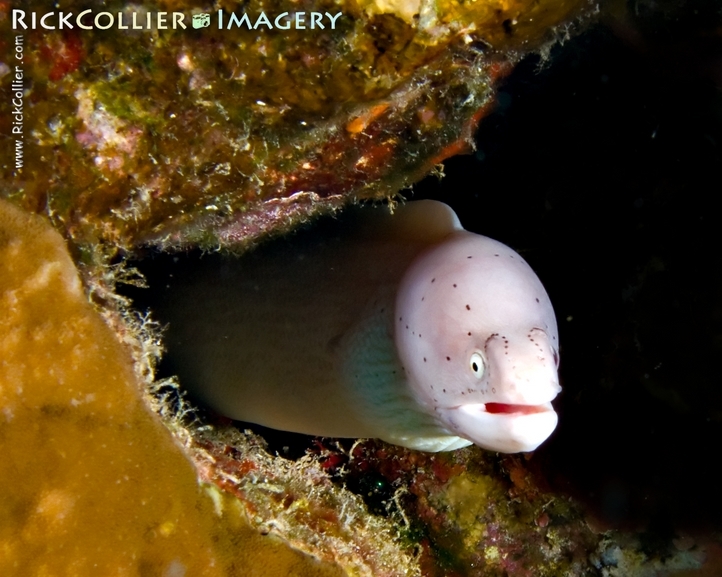 I could not place what I was seeing: I saw a white~ish eel-looking creature peering from an otherwise quite colorful reef wall. The white (light gray) coloration was striking, surrounded as it was be with bright oranges, reds, yellows, greens, and blues of the Red Sea. I had never even heard of a ghost (gray) moray eel. I snapped the shot, the flashes went off, and the eel was gone — disappeared like a phantom whisp back into its hole. Back in my room at Camel Dive Club and Hotel, I had a chance to look more closely: This is clearly an eel, but the markings are distinctive and clearly different from the usual green or spotted moray eels that are fairly common everywhere. The color is consistent, white or very light gray with distinctive dark spot-markings. So, here is yet another marvel of the Red Sea: A ghost moray eel. Another something fairly unique that is there for the patient, observant, and low-impact tourist to see in Egypt. This entry was posted on Tuesday, September 1st, 2009 at 19:32 PM. It is filed under thePhotoTourist, Underwater and tagged with Egypt, Gazlani, Gazlani Point, ghost, ghost moray, gray, gray moray eel, grey, grey moray, moray, moray eel, Ras Gazlani, Ras Mohamed, Ras Muhammad, Red Sea, Sharm el-Sheikh, Touring Egypt, Underwater. You can follow any responses to this entry through the RSS 2.0 feed.